The best Black Friday deal of 2014 is arguably at the gas station. The average price in America for a gallon of regular fell to $2.79 on Friday, according to AAA. That's nearly 50 cents lower than this time last year. That kind of savings adds up quickly and it's why economists and CEOs of retailers like Target (TGT) and WalMart (WMT) predict that consumers will be willing to spend more this holiday season. It's likely to go even lower soon. Brian Jacobsen, chief portfolio strategist at Wells Fargo (WFC), forecasts prices will fall below $2.70 and could go as low as $2.50. 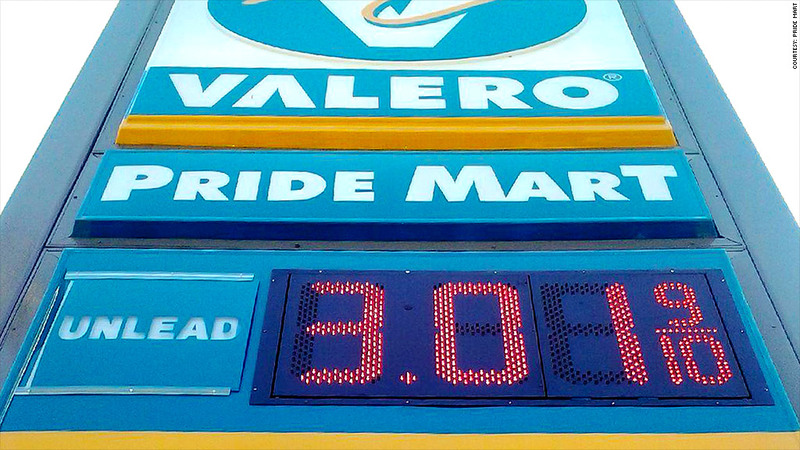 Cheap gas may be a factor in why more Americans are feeling better about the economy overall. In a recent CNN poll, 52% think things are going very well or fairly well in the country now, the first time a majority of Americans have felt that way in eight years. In states such as Texas, Oklahoma, Missouri and Mississippi, even mid-grade and premium fuel prices are averaging $3 or less a gallon. What's next? Gas prices are likely to stay low well into 2015 and even 2016, according to Capital Economics. For that you can thank U.S. drillers and OPEC. OPEC met on Thanksgiving Day in Austria and voted not to cut production at all. And the shale gas boom in North Dakota, Texas and even parts of the East Coast is bringing huge new supply onto the world market and keeping prices low. "It's really shale development that's been the blessing," says Lars Eirik Nicolaisen, an energy expert at Rystad Energy. "If not for shale, oil prices [per barrel] would have been $200." Crude oil is currently trading below $70 a barrel, an extremely low level that hasn't been seen in four years. To put that in perspective, countries such as Russia, Iran and Venezuela budget for oil to be around $100 a barrel or higher.